The altitude available is, in many ways, the controlling factor in the successful accomplishment of an emergency landing. If an actual engine failure should occur immediately after takeoff and before a safe maneuvering altitude is attained, it is usually inadvisable to attempt to turn back to the field from where the takeoff was made. Instead, it is safer to immediately establish the proper glide attitude, and select a field directly ahead or slightly too either side of the takeoff path. The decision to continue straight ahead is often difficult to make unless the problems involved in attempting to turn back are seriously considered. In the first place, the takeoff was in all probability made into the wind. To get back to the takeoff field, a downwind turn must be made. This increases the groundspeed and rushes the pilot even more in the performance of procedures and in planning the landing approach. Secondly, the airplane is losing considerable altitude during the turn and might still be in a bank when the ground is contacted, resulting in the airplane cartwheeling (which would be a catastrophe for the occupants, as well as the airplane). After turning downwind, the apparent increase in groundspeed could mislead the pilot into attempting to prematurely slow down the airplane and cause it to stall. On the other hand, continuing straight ahead or making a slight turn allows the pilot more time to establish a safe landing attitude, and the landing can be made as slowly as possible, but more importantly, the airplane can be landed while under control. Concerning the subject of turning back to the runway following an engine failure on takeoff, the pilot should determine the minimum altitude an attempt of such a maneuver should be made in a particular airplane. Experimentation at a safe altitude should give the pilot an approximation of height lost in a descending 180° turn at idle power. By adding a safety factor of about 25 percent, the pilot should arrive at a practical decision height. The ability to make a 180° turn does not necessarily mean that the departure runway can be reached in a power-off glide; this depends on the wind, the distance traveled during the climb, the height reached, and the glide distance of the airplane without power. The pilot should also remember that a turn back to the departure runway may in fact require more than a 180° change in direction. Consider the following example of an airplane which has taken off and climbed to an altitude of 300 feet above ground level (AGL) when the engine fails. [Figure 17-5] After a typical 4 second reaction time, the pilot elects to turn back to the runway. Using a standard rate (3° change in direction per second) turn, it takes 1 minute to turn 180°. At a glide speed of 65 knots, the radius of the turn is 2,100 feet, so at the completion of the turn, the airplane is 4,200 feet to one side of the runway. The pilot must turn another 45° to head the airplane toward the runway. By this time, the total change in direction is 225° equating to 75 seconds plus the 4 second reaction time. 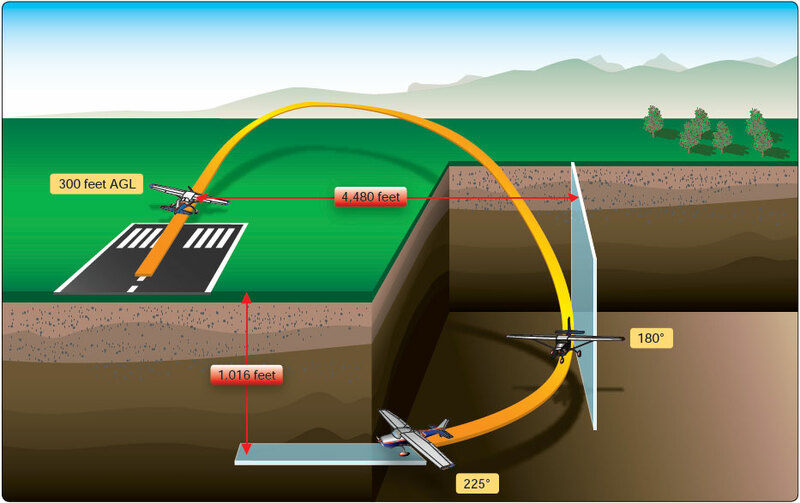 If the airplane in a poweroff glide descends at approximately 1,000 fpm, it has descended 1,316, feet placing it 1,016 feet below the runway.